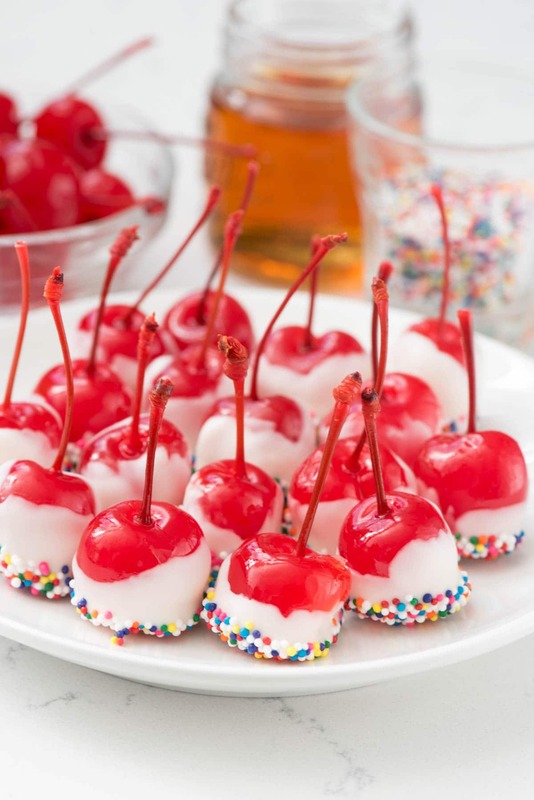 Drunken Cherries recipe – this easy recipe soaks maraschino cherries in alcohol and then you dip them in chocolate. The perfect easy treat! I just think it’s funny she loves Shirley Temples so much because until recently she hated cherries. She also hated whipped cream until about a year ago (seriously, I had to check to make sure she was really mine). I couldn’t ever take her to IHop for the face pancake because she’d scrape all the good stuff off. Basically the moral of the story is that, when I was making these cherries I had to take a sharpie to the jar and write DO NOT EAT all over it in big block letters because she’s been known just to pop into the fridge for a cherry now and again and if she’d gotten a few of those bad boys she would have either gotten really sick or someone would have called CPS on me. The cherries are not for children…they’re drunk. Very, very drunk. How do you make drunken cherries? Last 4th of July a friend of mine brought drunk cherries to our party. She’d soaked them in Fireball (cinnamon whiskey, so good, so dangerous) and then dipped them in chocolate and blue sugar. They were SO good and packed a bit of a punch too. I knew I wanted to make them sometime for myself. Last weekend I went to a mom’s only Christmas party with a few of my besties and I was in charge of dessert (obviously). I decided to make the drunk cherries because they’re super pretty for a Christmas or New Year’s Eve party (or Valentine’s Day!) Instead of using fireball, I used amaretto. 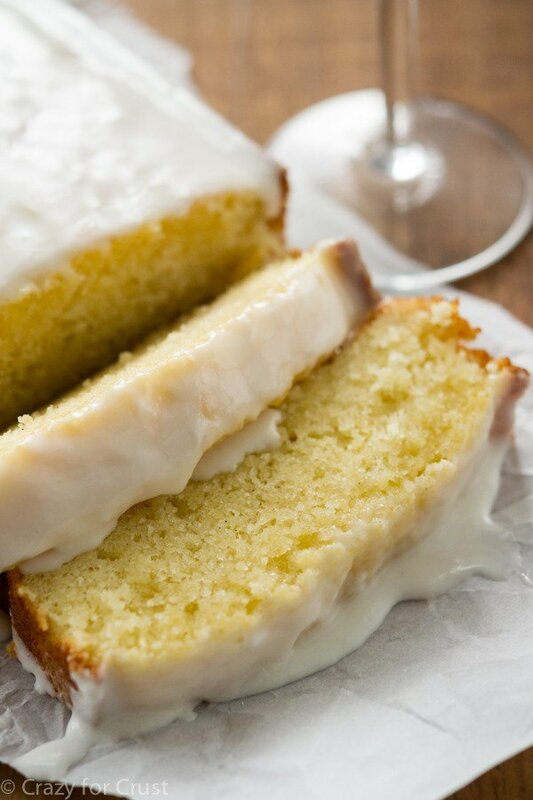 I think you could also use vodka (vanilla, whipped cream, or cake would be amazing). Simply pour out the cherry juice in the jar (save it for Shirley Temples) and then pour the alcohol of choice in. Chill them for at least 24 hours (the longer you chill, the more flavor they absorb). Once they’re done soaking, drain them (again, reserve the liquid for cocktails) and then pat them very dry. This is a key to getting the chocolate to work out – drain them well and then pat them down gently with paper towels. Any liquid can seize your chocolate so be sure to do this step. Then, once you’ve dried them, you dip them into white chocolate and add sprinkles…and then you have drunken cherries! I recommend using almond bark or Candiquik instead of white chocolate chips. They are made for dipping and can withstand liquid better. I also worked in batches (2 ounces of candy at a time) for melting and dipping in case my chocolate seized in between. I like melting candy in disposable Dixie bowls; they’re microwave safe and you throw them away after – easy cleanup! Once you dip the drunken cherries in the chocolate, you can dip them in sprinkles too. Aren’t they festive?? They were gone even before the fudge and brownies, so I know everyone loved them. Drunken Cherries recipe - this easy recipe soaks maraschino cherries in alcohol and then you dip them in chocolate. 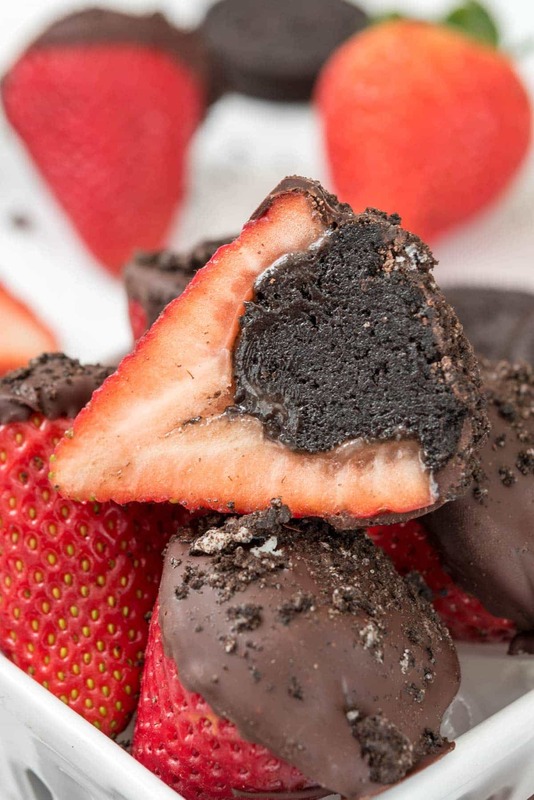 The perfect easy treat! 5 ounces alcohol of choice: amaretto — vodka (any flavor; vanilla or cake would be amazing), fireball, etc. Pour alcohol in the jar to fill. Replace cap and soak for at least 24 hours. The longer they soak, the stronger they'll be. Work in batches: melt 2 ounces of chocolate in a small bowl. (I like using paper bowls for easy cleanup.) Melt according to package directions. Dip each cherry in the white chocolate, then dip in sprinkles and place on a wax paper lined cookie sheet. Chill to set. Working in batches of chocolate allows you not to waste any, plus allows for the chocolate to seize from the liquid without ruining the whole batch. Use a new bowl for each batch of chocolate you melt. Many,many years ago when we were all young I sent monthly care packages to my brother-in-law who was overseas in the army . I always included a few jars of cherries in brandy . By the time they left my post office and reached his base the cherries were well saturated . Needless to say he became a very popular fellow and made many new friends !!!! Thanks for the memories ……………..
Can these be frozen??? Before or after dipping in chocolate and sprinkles?? Happy hour just got even HAPPIER! I made these for a holiday party and they were the first to vanish!!! Love this, so easy. Just follow the directions and you’ll love the results! 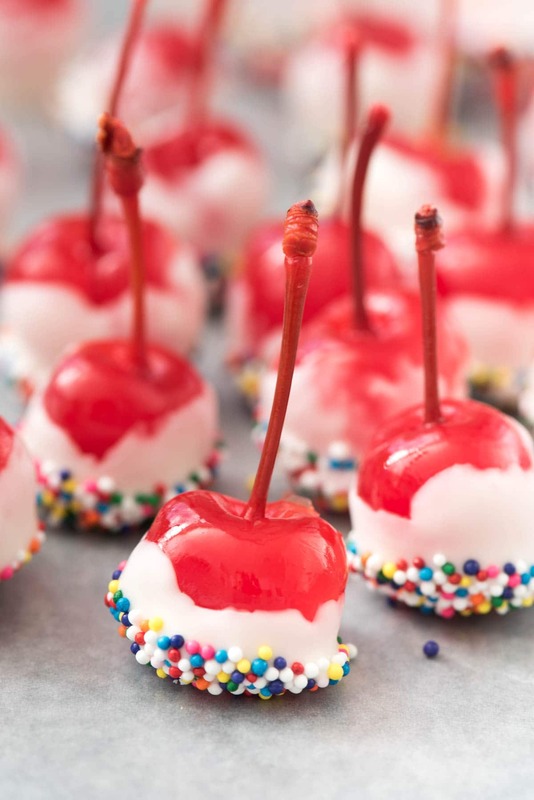 OMG I have made these for many a bachelorette party , 4th of July BBQ (with blue sugar crystals, white frosting, red cherries), and lake side adventures. ALWAYS a hit. I have tried a variety of alcohol baths and I love vanilla vodka with just a hint of fireball… wowza! So yummy and once you have one you keep going back for more! Going to make me some drunken ones using fresh cherries and non flavored moonshine .